Luscious Avocado Coconut Burfi…in 5 minutes! 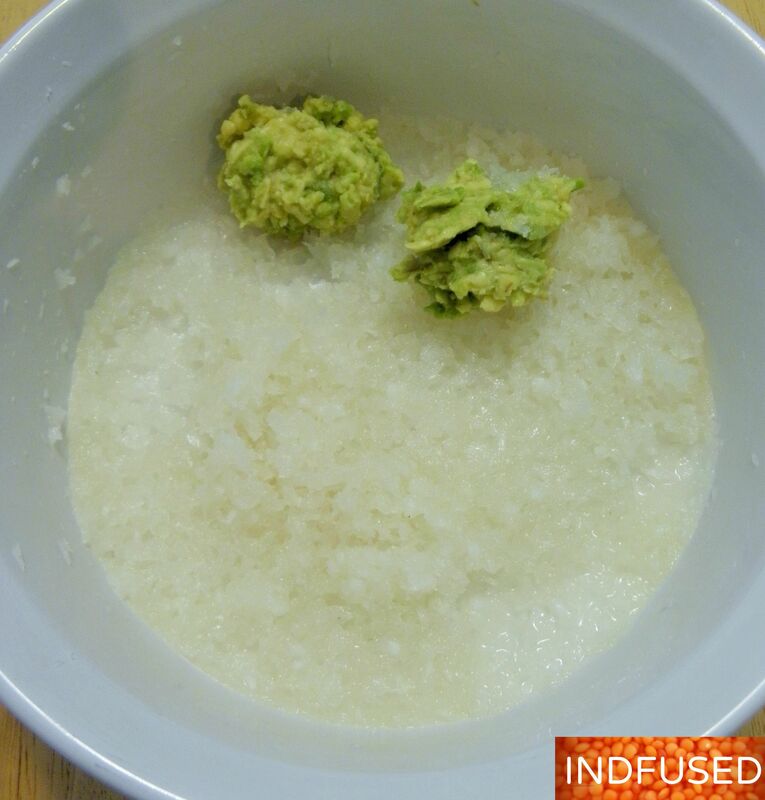 Luscious Avocado Coconut Burfi …..in 5 minutes! Luscious Avocado Coconut Burfi in 5 minutes! 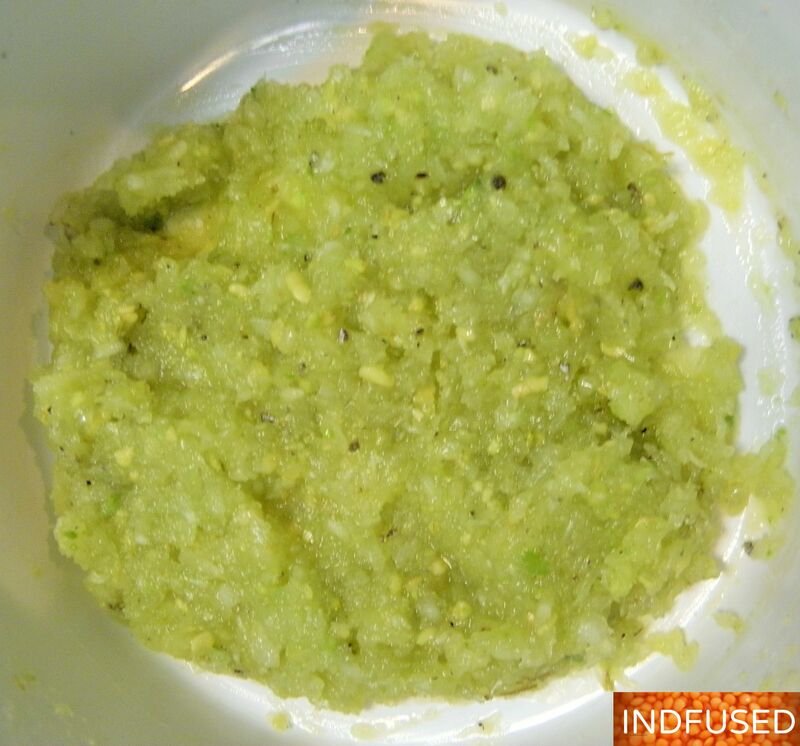 A special halwa for Narali Pournima and Raksha bandhan this weekend! Narali Pournima is a jubilant festival celebrated in Maharashtra and along some coastal areas in India. It is celebrated on the full moon day in the holy month of Shravan. The word naral means coconut. Pournima is the full moon day. The monsoon season, during which the seas are turbulent, comes to an end around this time and it is once again safe for the fishermen to brave the seas. But before they do that the families offer the auspicious coconut to the sea, praying for the safety of the fishermen. Foods containing coconut are made to celebrate this festival. It is also Raksha bandhan day, a special day of celebrations for brothers and sisters. 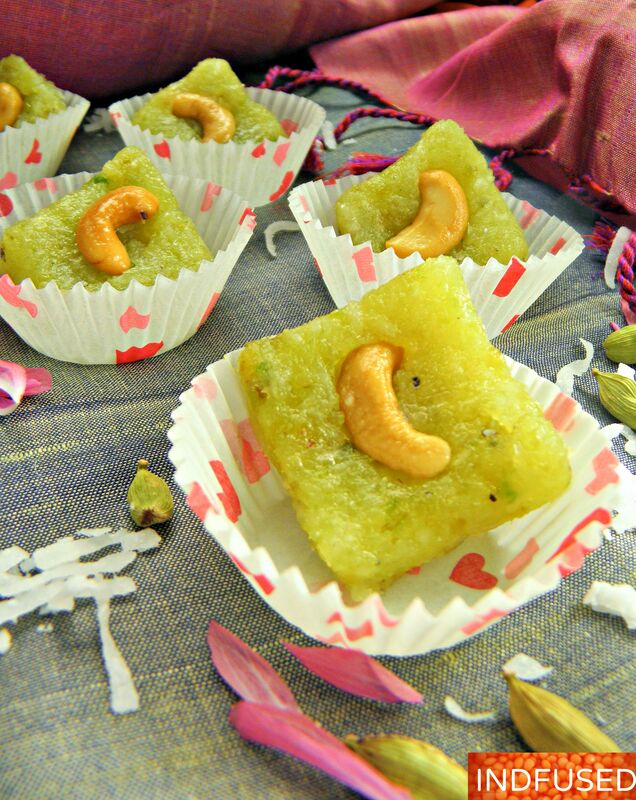 One of the most popular foods made on this day is the coconut burfi or vadi. The coconut burfi is the softer of the two, with a fudge like consistency. Khoya, which is milk cooked until it thickens into a paste consistency, is used to achieve that softness. I experimented using avocado, for its monounsaturated fats, instead of the khoya and am happy with the results. Not only did the avocado lend the richness of the khoya, it also gave it a beautiful, natural color! As for the taste, the coconut and cardamom are very dominant with a hint of avocado, all of which translates to ‘one luscious burfi’! Add the sugar, microwave for 2 minutes. Then add the grated avocado. At the end of 2 minutes, this is the texture of the mixture. Spread the mixture and decorate with nuts, as directed in the recipe. Another view of the rolled mixture. Ghee to grease the plate/ tray to set the burfi in. 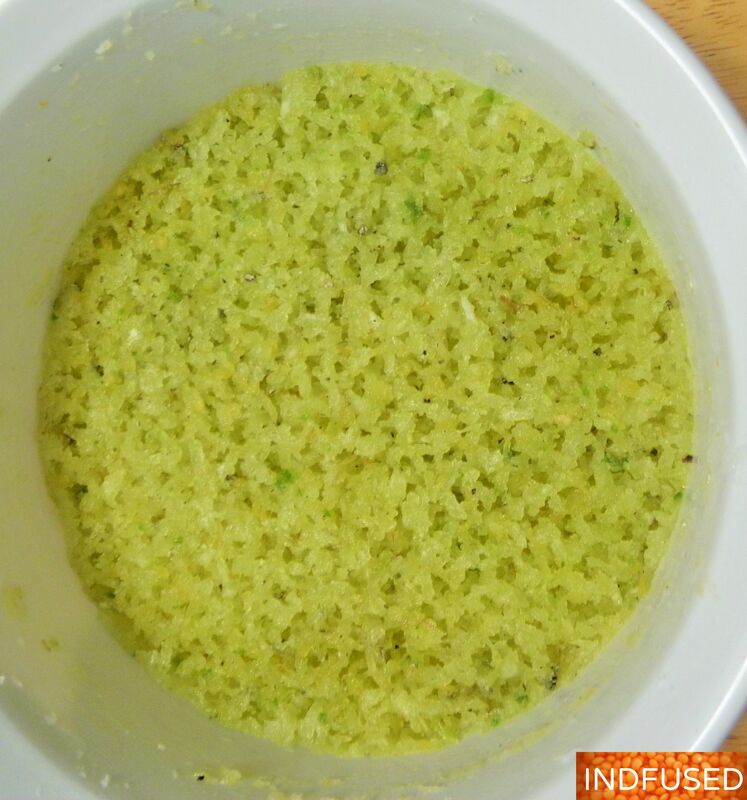 Mix the grated coconut and ghee well. In a microwave safe bowl, cook on high for 1 minute. Add the sugar, mix and cook for another 2 minutes on high. Add the rest of the ingredients, mix well and cook on high for 2 more minutes. 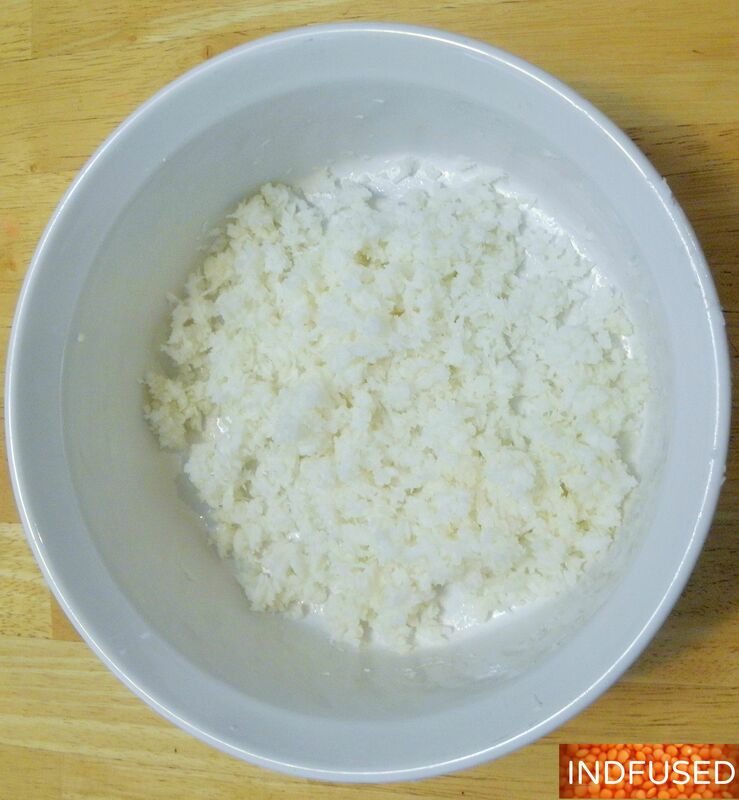 Remove from microwave and spread the mixture evenly on a greased plate, using the back of a spoon or cover with wax paper and roll it out using a rolling pin. Add nuts and press them in lightly with the rolling pin. Let the mixture set in the refrigerator for a minimum of one hour. Cut into squares and serve! Enjoy the luscious treat ! Individual microwave timings may vary, so adjust the time accordingly. Very creative Sandhya, barfi looks absolutely delish. Thank you Shilpi for visiting and for your sweet comment. No problem, Robin. Take your time with the awards. Enjoy your time with your daughter and the little one! Have you added cucumber as the mix in the image-3 i can see the cucumber seeds. I think you can make yourself clear to the viewers. The burfi looks wonderful for sure. I have added avocado ,not cucumber, as I have said clearly in the recipe. Thanks a ton Aruna! Wow! I am thrilled to get that compliment from an accomplished person like you! Thank you so much, Lina! Avocado and coconut sounds like a delicious combination! And I love the colour that the avocado brings to the burfi…how pretty! I love reading about all the food that is prepared for these festivals in India and am amazed at how many different dishes are specific to certain regions and cities. 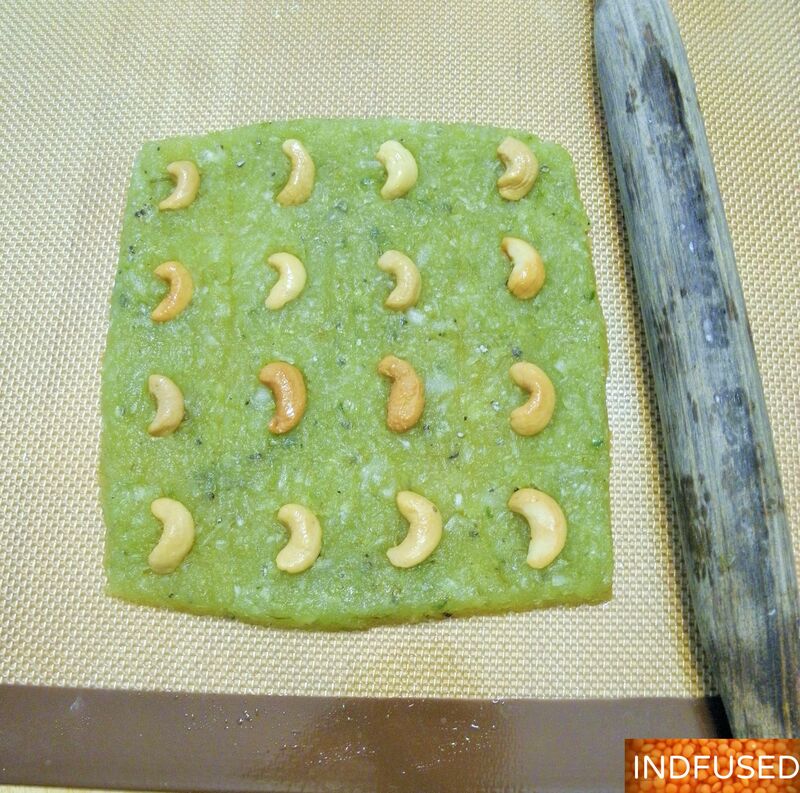 Your Burfi sounds healthful and delicious, love the combination of avocado and coconut and the cashew is so nice it looks like the moon. This is so quick and simple I love it. I try to go to the Indian Day parade in NYC whenver I can, I eat my way from one end to the other. So delicious. Thank you so much Suzzane. Yes there are so many festivals and foods in different regions of India. Also I love reading about different cultures on various blogs, so I thought I will give a little background of the recipe. too. I can relate to eating from one end to the other. Last summer I went to the Smorgasboard in Brooklyn an date so many different foods from all the food carts that gather there. I have been to the NYC parade many years ago. It must be much bigger than what I remember. I love Smorgasburg it’s So much fun and so much great food. The Indian parade is pretty big. All the food is at the end and entire block lined with different vendors it’s great. Avocado-coconut is a match made in heaven. The cashew top up is the icing to the cake! Super like!!! Thank you so much Julie for your sweet comment! Another great microwave recipe of one of my favorites Sandhya. Gosh, Diwali is around the corner, I wish you lived closer, I have such a weakness for Indian sweets. I have made burfi before years and years ago, you always make yours so healthy though, so I’m gonna give this a try. Love the idea of coconut and avocado. Yummmmm! Loretta, I was happy with my experiment replacing the khoya with avocado. ….I love coconut burfi too:) yes, this is healthy.Some burfis are loaded with ghee.Do let me know how you like it. These look so lovely Sandhya and must taste even better! Thank you Naina ! Really appreciate the kind words! I read your post Robin! Thank you for the sweet words about me and my blog! I am so touched ! This is truly a novel fusion! Trying out a version of this today as I have an avocado lying around! Thank you Apsara! Do let me know how you like it. I tried this on the stove top with half an avocado, fresh coconut, dates and sugar. We loved it. Excellent idea, thanks for sharing. An avocado well used!! Apsara, thank you so much for letting me know. I love the addition of dates in it too. Another fine recipe idea to try! Thanks. Hope you’re doing well and having a good start to the season! How are you doing? Blogging is keeping me busy… only we bloggers understand how that goes, right? what a wonderful combination, avocado and coconut. We get loads of avocados here, so will try this recipe. Thanks Mayuri. Do let me know how you like it and post a picture to the Indfused FB page! Komal, you can spread the burfi on a plate or thali too. Cut avocado usually becomes blackish after some time. Did you notice this with your barfis? Thank you for your question. I cut the avocado right before cooking it in coconut sugar mixture.The avocado did not discolor and retained its green color in this burfi. Reblogging one of my top posts for the festival of Narali Pournima and Raksha Bandhan coming up this week. I enjoyed learning about the Indian holidays and the meaning behind them, Sandhya! The coconut, avocado, and cardamom must go so well together. Traditional foods are so comforting on holidays! Thanks so much Shari. I love learning about holidays and festivals from different cultures too. The traditional recipe for this is ghee, coconut and sugar with cardamom. I experimented with the avocado and cut down on the ghee and was happy with the outcome. thanks again for your sweet comments. 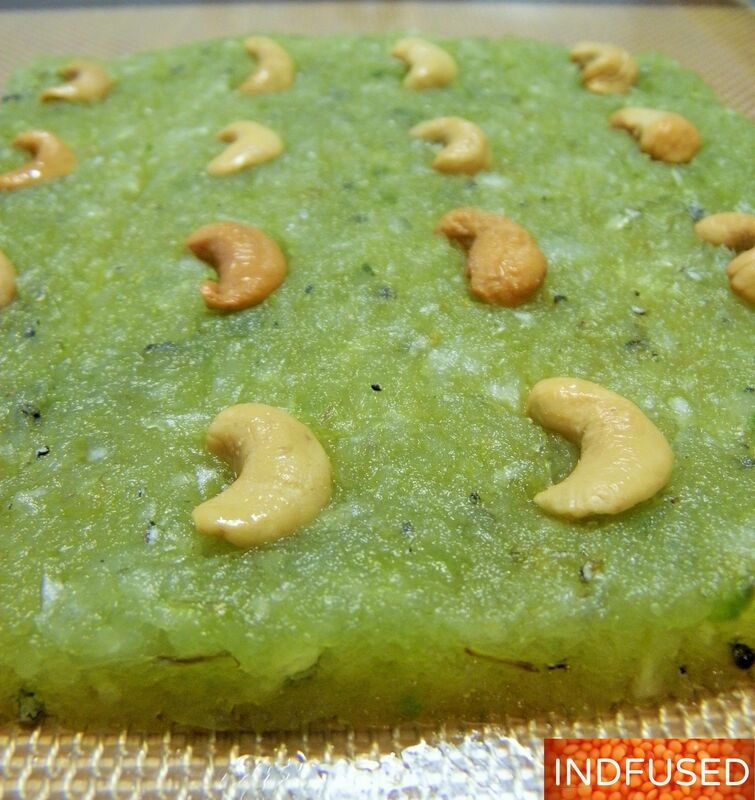 Wow, avocado and coconut burfi, I am sure it will taste awesome and will try to make it soon. This really tastes awesome! Thanks for reblogging!